We prepare mail and send it but do we have any idea what happens after that email is sent? Did the recipient receive it? Did it get lost in their inbox? Did they click on the links? Opened attachments? We should be well aware of our send campaign’s Email Tracking Analytics. This helps you to track the behavior of email recipients whether they like our emails or not. This analysis surely helps us in drawing the different patterns for required improvements in our mailing strategy. Email Tracking is possible with the help of Google Analytics. Google Analytics is used effectively for monitoring your emails. It is a service offered by Google. Strange to know Isn’t it..?? Obviously it is as many audiences still consider that GA is used only to track how many people visits their website and their average session time. It notifies when an email is sent whether it has been opened or clicked. Email tracking works in the background without interrupting our recipient. We place an invisible image pixel in our emails that can detect the exact time and date an email has been opened. Email tracking can tell us when, how many times, where, and from what device a recipient opened our email. Today in this tutorial, I’ll show you how to use GA to gain statistical insight into your outgoing emails. Step 1 :- Create Google Analytics Account For Tracking Id. Within Property column select Property Settings. Under Basic Settings you can see Tracking Id. Step 2 :- Create Campaign On Google Analytics. Go to Reporting Tab of Google Analytics. Click on Add Segment below Audience Overview. Create New Segment on Clicking + NEW SEGMENT. Write your Campaign Segment Name. 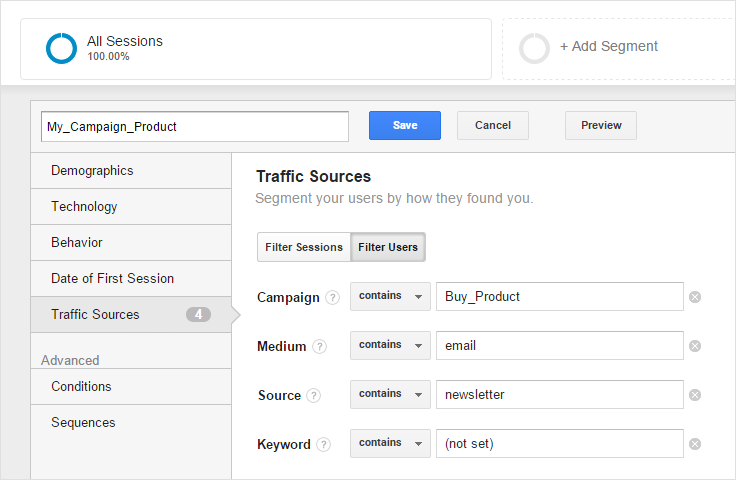 Fill parameter’s of Traffic Sources and click on Save button. Step 3 :- Create A URL For Analytics. This URL contains information about your Google Analytics tracking id, event category, event action, campaign name etc. Step 4 :- Append This URL In <img>’s SRC Attribute. // write your content here. Step 5 :- Now Just Send Email As A HTML. This is the most important step as if you don’t send Email as a HTML, Gmail will consider this email message as a TEXT and you can not track whether an Email is opened or not using Google Analytics. Step 6 :- See Your Campaign Result On Google Analytics. Click on Real-Time Menu Of Left Side Bar. And select Overview option to see how many users have opened your email at present. Click on Acquisition Menu Of Left Side Bar. Select Campaigns option from Acquisition drop down menu. And select All Campaigns option to see how many users have opened your email. Do I need to have a unique Customer ID generated for each email sent out? How do I do this? Customer ID is the middle number taken from your Tracking ID. Where, Customer ID is the part that is bold. 1. Does the image with the tracking URL have to be a 1×1 transparent graphic? Can I put the URL on a header? 2. When creating a new Segment and editing the Traffic Sources, how do I select the name of the “source”? Is this arbitrary? Seriously, thank you so much for the help! I’m kind of new to this as you can tell.